This spacious two bed, two bathroom apartment is situated in the heart of the city and just off of oxford street itself so you really aren't far away from anything. 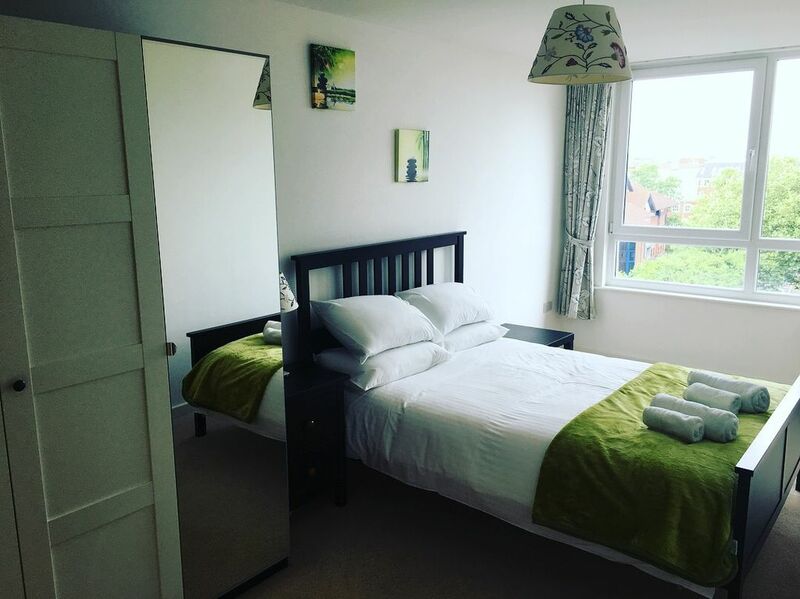 Just a short walk away from West Quay shopping centre and high street shops, cruise terminals, southampton central train station, the guild hall, mayflower theatre, saint Mary’s football stadium (home to Southampton FC) and all of the bars and restaurants southampton has to offer you really are in the right place. The kitchen and living area is open plan and very spacious, the kitchen is fully fitted and includes a fridge/freezer, toaster, kettle, microwave and washing machine. The living area has a large sofa, free view TV and table and chairs. The whole apartment is fitted with wifi throughout. Flat looks just like the photos. Very clean. Beds were comfortable. Thank you for your review, we hope that we can provide you with one of our apartments on your next visit. We had a great stay in this lovely apartment. Photos do not do it justice. Neil always replied to our questions promptly providing easy to follow secure entry instructions. We liked the secure parking available to us under the apartments. We will be back again soon. Was exactly as expected from pictures and details. Easy booking process. Apartment very clean and well equipped perfect for our short stay. Thank you. Very impressed! Pictures don't do it justice! I would highly recommend this apartment, it was clean, well maintained and very stylish! The beds are super comfy and warm. Fully stocked the only thing you need to bring is clothes and food! The landlord was extremely helpful with our late check in and also our stay and check out. Would highly recommend this apartment to anyone! Absolutely fantastic 10/10 on service and apartment!